A Kerry King comment, from either the present day or from twenty-five years ago, mentions how thrash and speed metal bands gradually rejected use of the riff as primary vehicle of expression in songs in favour of chord progressions. Slayer themselves were complicit in this transition from South Of Heaven onwards, switching to a more conventional style of songwriting than was found on their preceding two landmark albums. The biggest difference between the heavy metal of bands like Judas Priest and the riff-stitching brought on by the likes of Slayer and Metallica, at least on Kill Em All, was a shifting of the song’s goalposts; where, previously, songs moved around a central melodic vertebrae, sending out minor, tentative offshoots at best but never really diverging from the main premise of the song proper, the advent of thrash metal collapsed this superstructure upon itself. The musical worldview was attenuated drastically to the level of the riff, which now became a frantic virus capable of far greater movement than allowed by the restricting nature of traditional heavy metal chord progressions. The riff was now a world within and of itself, and what’s more, it could interact with other similar worlds scattered across the songscape. This dialogue, however, is heavily dependent on the internal integrity and quality of the riff itself, and a knowledge of how two different riffs should interact with one another and with the many others that may exist in a song. One of the reasons why thrash metal has turned out to have the shortest shelf-life of all metal genres is that the riff-salad approach, by definition, doesn’t lend itself to any kind of consistently coherent song-writing. But the basics of what a good song should comprise of haven’t changed through hundreds of years, whatever the form of expression may be. Intrinsic logic, communication between parts, and memorability aren’t just fancy phrases to be used in reviews that nobody reads; they apply to a Tom Waits song as much as they do to Morbid Angel. Decent riffs aren’t Abominator‘s problem. Evil Proclaimed is a thoroughly riff-driven album unlike much posture-obsessed, monochromatic modern war metal and for that much, fans should be grateful. This is very intense death metal in the vein of Angelcorpse and doesn’t care about variation in tempo or mood. That is quite alright too; their chosen arena requires this of them, and they are fans enough to know not to substitute actual riffs with a wash of shapeless noise. In this they are respectful of the genre’s history and deliver an album of genuinely blistering attack. Where Abominator could improve is in ensuring that the jump between riffs isn’t too jarring. The song posted below is an example of these abrupt shifts in tone that reduce it to a discrete series of parts holding little meaningful consistency with each other. Admittedly, other songs on Evil Proclaimed fare somewhat better, but the point holds for the album, and the genre, at large. Where great bands like Slayer excelled was in preserving the feel of a song despite building it out of many individual and sometimes seemingly disparate components. Abominator are using the same approach thirty years later, but aren’t quite as adept at rendering their music as “songs”. There is much to like here in the moment but concealed within are also reasons why so much modern extreme metal fails to retain lasting appeal. 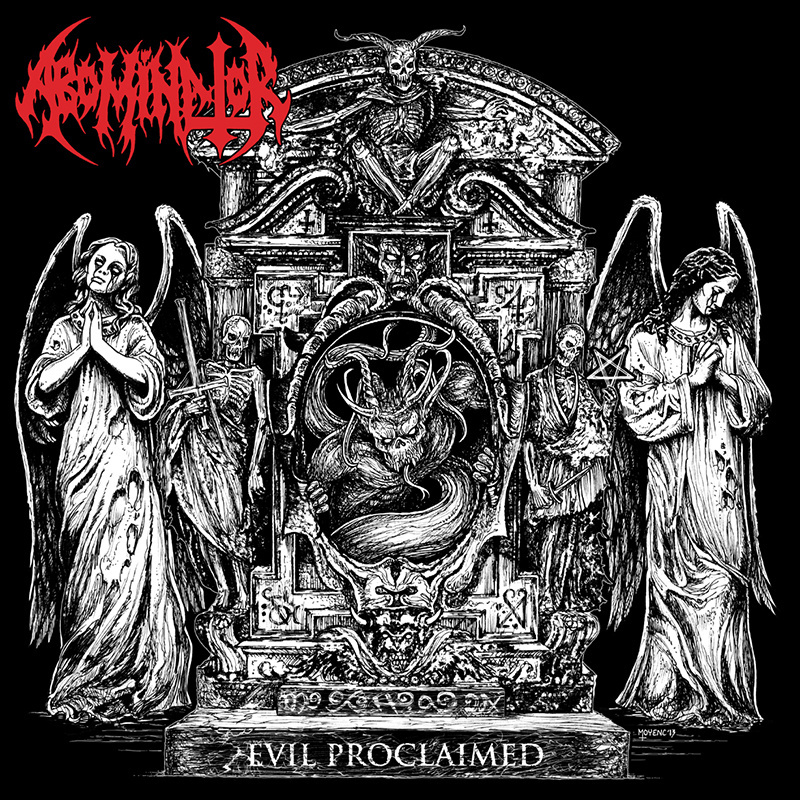 This entry was posted in Uncategorized and tagged abominator, Australia, Evil Proclaimed, Riff stitching, Slayer. Bookmark the permalink.